The 3M Hot Melt termination system is renowned worldwide for its consistency, ease of use and high performance. 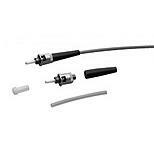 A wide range of connectors are available each pre loaded with adhesive which is activated when inserted into the specifcially designed Hot Melt ovens. Users new to fibre termination may purchase a kit which contains both cable preparation tools as well as the Hot Melt specific accessories such as the oven and connector holders - used to position the connector within the oven. Those users with fibre preperation tools need only purchase a Hot Melt conversion kit which contains all of the Hot Melt specific equipment required to start using this industry leading termination method.